If you have a little explorer in your house, then you might want to check out the GeoSafari® Jr. Bright Eyes Magnifier™ from Educational Insights. Make discoveries in the dark, just like an owl! Spy your subject, turn on the red LED lights for better night vision, and examine the details of your specimen, magnified 2x and 8x. Perfect for hikes and other daytime explorations, too. It’s a hoot! The GeoSafari® Jr. Bright Eyes Magnifier™ is a very durable magnifier. It is easy to hold and grip for younger hands. Set up is a snap as the GeoSafari® Jr. Bright Eyes Magnifier™ just requires 2 AAA batteries and then your little explorer is all set. The batteries are required to run the red night vision lights. We put our GeoSafari® Jr. 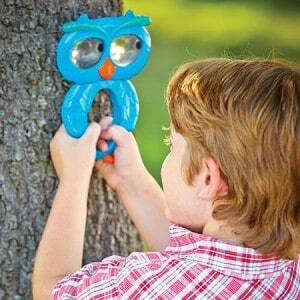 Bright Eyes Magnifier™ to the test with exploring pine cones and other items. My Little One thought it was quite awesome to be seeing the pine cones magnified. The GeoSafari® Jr. Bright Eyes Magnifier™ is easy to pack so it makes it great for around the backyard and for your outings to the beach, camping, hiking, and anywhere your little one will want to explore. The GeoSafari® Jr. Bright Eyes Magnifier™ also comes with the Educational Insights “Playful Promise,” that gives you 365 days to love the product or you can return it. At the time of this post, the GeoSafari® Jr. Bright Eyes Magnifier™ is an affordable magnifier at $12.99 USD. The GeoSafari® Jr. Bright Eyes Magnifier™ is rated for ages 3 and up and I would agree with this age ranking. I really think that this magnifier is something that the younger explorers can enjoy, easily use, and have an easy time gripping. E would like Nancy B’s Science Club MoonScope™ and Star Gazer’s Activity Journal. The Sneaky, Snacky Squirrel game would definitely appeal to my little guys. I also like the Magic Moves® Electronic Wand. Thanks for the giveaway! I really like the GeoSafari® Jr. Underwater Explorer Boat!